Honestly, I too have battled with sugar, and over the years, I have been able to make peace with it! Who doesn’t want peace?! I’ve been through phases where I have completely given it up, and while it did teach me something about how I feel when I’m off of it, it just made me worried about whether I could have chocolate and want more! And it only worked for the short term, which isn’t very much fun. Now I enjoy some quality dark chocolate or other sweets on occasion but I don’t feel controlled by sugar. We have a major issue with consuming too much sugar in our country. The average American consumes 32 teaspoons of sugar per day. It is the source of diseases and the winner of the #1 food additive award! It is added to drinks, sauces, bread, dressings, and various packaged foods including many low-fat products. Let’s face it, sugar is everywhere! 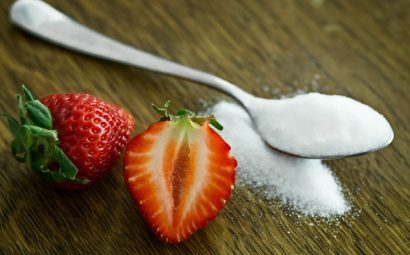 I’ve found that making peace with sugar has been something that has worked best for most nutrition clients and for me. Black or white doesn’t seem to work for the long term. Now if there are more serious issues like diabetes, cancer, candida or digestive issues you may need to be more vigilant with your sugar intake. Is all sugar created equally? No! Naturally occurring sugar in fruits and vegetables come with added fiber that slow down digestion. Fresh fruits have micronutrients that may prevent the uptake of sugar in our small intestine. This just means you can enjoy eating fresh fruits without the blood sugar spikes. Cutting your sugar intake could be one of the best ACTIONS YOU CAN TAKE to improve your overall health. How do you do this? Identify the source - cookies, cakes, Easter candy, ice cream, sugar beverages. Can you cut it down? I found that cutting down in a more gentle way works better for sticking with it. If you eat a cookie after lunch or a pastry every morning, can you trade the cookie for a piece of fruit on most days and have a cookie on 1 or 2 days? Or could you do a sugar beverage 1x per week instead of 5? Instead of 2 teaspoons of sugar or fake sugar, can you do 1? One strategy might be cutting added sugar (as in processed foods). Eat more real foods - start replacing junk foods - chips, candy, health bars, etc. with fruits, avocado or other veggies, eggs or lean protein and nuts. Move more! The endorphins you get from moving your body (could be a HIIT workout, stair walking, hiking, gym workout, yoga, etc.) will give you similar feeling as the cookie without the added sugar. Water - Staying hydrated not only helps cellular function, but also keeps you from thinking that you are hungry. Work with family and children and friends - How can you be a role model and get some support too? It takes a village!